"During summer, some little jungle animals meet together for several weeks in Summer Camp ! Their days are punctuated by many educational activities, nature discovery and beautiful evenings by the fireside singing the melodies of their amazing activity leader Gorilla..."
This pack of kids room or baby nursery wall decals brings together many cute jungle animals in Summer Camp : gorilla, hippopotamus, little tigers, lion cub, hippo, elephant and bear. A new amazing design from E-Glue Studio that softly adds originality to your kids room decor and fulfills all parents wishes in love or collectors of the famous Van Transporter Kombi VW. 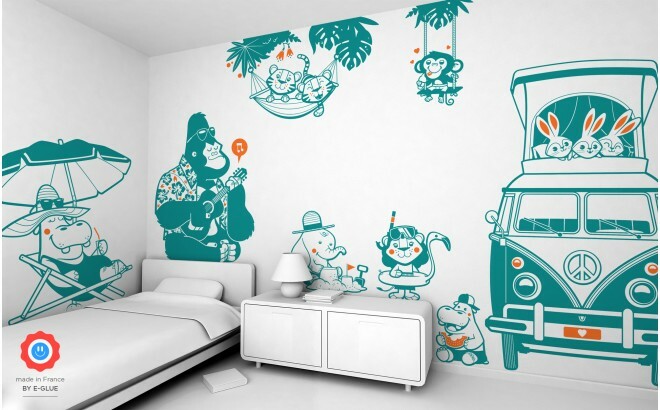 For example, see below a wall decal Gorilla (Bahamas blue and pastel orange) applied on a light grey wall.